• Basic - cardiac anatomy, ECG theory, lead placement, wave-forms, and intervals. • Intermediate - rhythm strip interpretation and meanings of abnormal wave forms, abnormal intervals, and arrhythmias. • Advanced- 12-lead ECG interpretation, including QRS axis, infarct diagnosis, infarct location, and infarct age. Identify the causes of ST depression. Master the diagnosis of chamber enlargement or hypertrophy, acute and chronic pericarditis, ischemia, and more. When you're ready, MicroEKG will present 12-lead ECGs and rhythm strips for interpretation. You type an ECG diagnosis in plain English, and the program evaluates your interpretation. 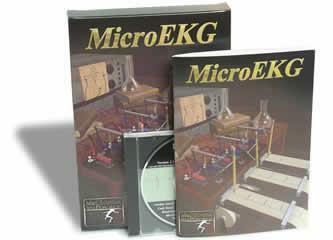 MicroEKG provides hints, pointing out any features you may have overlooked. System requirements: Windows only – Windows 7/Vista/XP; PC with 300 megahertz (MHz) or higher processor clock speed, 128 megabytes (MB) of RAM or higher, 5 MB Hard Disk Space, Super VGA (800 × 600) or higher resolution video adapter and monitor, CD-ROM or DVD drive, Keyboard, Mouse. Price: Single user: $49. For multicomputer licensing contact sales.